With Earth Day being today, everyone is celebrating including our friends over at DK Canada. I absolutely love how many different books they have to help you and your family celebrate Earth Day. Each of their books offers you a chance to stop and appreciate the wonderful planet that we call home. And for a limited time they are offering their love for the Earth titles at a 30% off discount. Not only are these books great to read for your love of the outdoors, but there are also books on gardening as well as a great selection of books for your kiddos. I actually received a couple books I thought my kids would love. One was Outdoor Crafts, which has been perfect for us since we've been having so much nice weather lately. 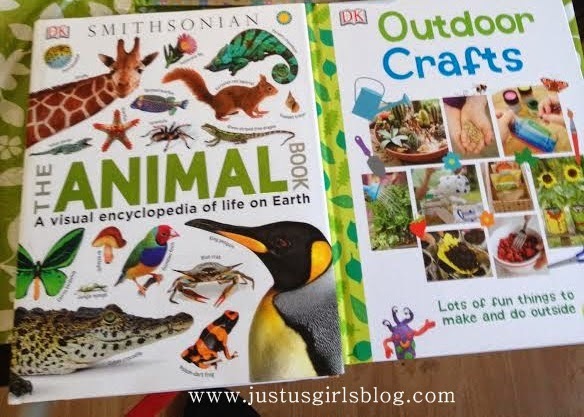 Not only are the crafts in this book easy, but they also allow my kids and I even more time to spend with each other. Filled with 80 pages of crafts, we'll be enjoying creating and cooking up some new goodies for us to enjoy together. Another book I received was the Smithsonian Animal Book. This is definitely an amazing book that has over 304 colorful pages filled with different animals and information about them for my children to learn. This will definitely be something both my kiddos will be reading and enjoying. They love animals and with a book filled with information about them, will only grow their love for animals. Be sure to head on over to DK Canada's Earthly Pleasures sale now and get you and your family a few books to help celebrate Earth Day!